Apparently we're less than a week away from a new look at Grand Theft Auto V. At least, that's how it seems. Early this morning the Rockstar Games Twitter account posted a very brief message along with a mysterious image. That image can be found embedded at right, and the message reads "MICHAEL. FRANKLIN. TREVOR. #GTAV Trailers Coming April 30," alongside a link to the official Grand Theft Auto V website. Interesting? Not terribly. News worthy? Based on the frankly massive sales of every Grand Theft Auto entry since GTAIII, absolutely. So, what can we glean from this tiny scrap of information? At the minimum, it appears that there will be a new trailer for Grand Theft Auto V appearing on April 30. That would be next Tuesday for those of you lacking a handy calendar. The mysterious part lies in those names. They appear to be the monikers assigned to the three protagonists of Rockstar's upcoming open-world crime sandbox, but then there's the plurality of "trailers" that makes us wonder if Rockstar plans to drop a single vignette or multiple clips. Going by sheer numbers and even more sheer speculation, we'd hazard to guess that each protagonist will receive his own trailer, demonstrating what exactly he's up to in the world of Grand Theft Auto V.
The easily offended (read: those who routinely point to Rockstar's franchise as the postergame for the corruption of modern youth) will be quick to state that we already know what each of these men will be doing: Gunning down cops, carjacking civilians and beating prostitutes to death with whichever blunt implement is closest at hand. 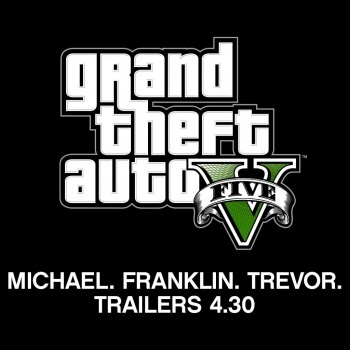 However, Rockstar is nothing if not canny, and it wouldn't be entirely shocking if, come April 30, we find three trailers comprised entirely of Michael, Franklin and Trevor going about the relatively peaceful aspects of their lives. Not that we suspect that Grand Theft Auto V will skimp on the wanton brutality, but Rockstar knows what the media expects from it, and has never shied away from controversy. And at this point, what could be more controversial than a massively-anticipated Grand Theft Auto sequel seemingly focused on delivering ice cream to school children or guiding tourists on donkey rides through the game's Grand Canyon analogue? Ah, but we're just throwing darts against the wall. We won't know anything until April 30, but look at all this space I have to fill! Anyway, now it's your turn. Comments below. Speculate wildly. You know the drill.